This is one of those cards that came out completely different than the way I pictured it in my head. Luckily, it came out looking different in a good way! After my background was done, I buffed some Black Soot Distress Ink through my Angled Trees Stencil using a sponge dauber. This is where I messed up a little. I forgot to heat set the distress ink and it stayed wet and caught some of my sticky embossing powder. Oops! The Angled Trees Stencil is a Two Step Stencil that you can stack to get extra effects. I stacked the dotted angled tree on top and then patted my Versamark Ink Pad all over it. (If you do this, please be aware that some of the distress ink will transfer to your Versamark ink pad.) 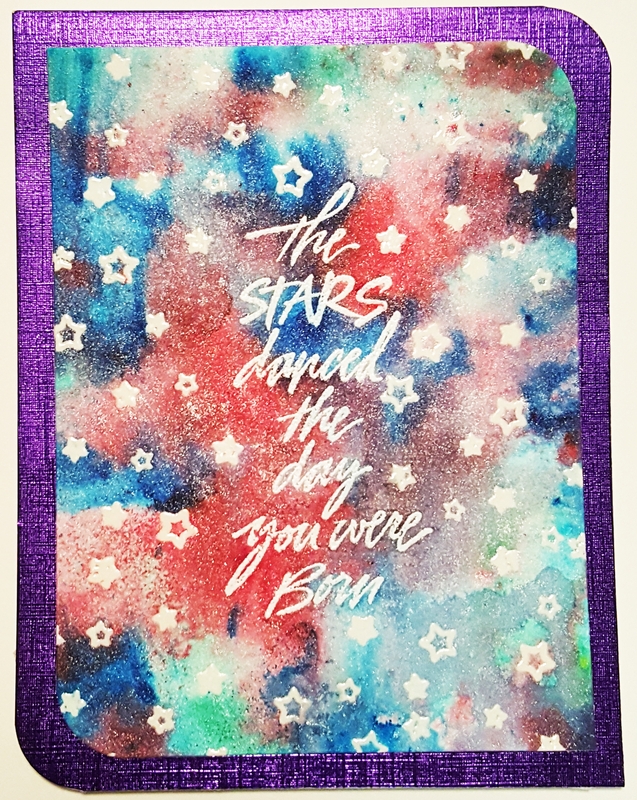 You can also use an Emboss It Dabber, which I ended up doing for the star. Then sprinkle some Sticky Embossing Powder by Ranger all over. Now you can heat that until it gets shiny and quickly apply some Fab Foil or Ranger’s Foil Sheets. Make sure to burnish it well and wait for the Sticky Embossing Powder to cool. Then just rip the sheet off. If you are using Fab Foil, it will result in a distressed look like you see on my card. It’s not exactly what I had in mind, but I think it looks cool! I just adhered my card front to a black card base and called it done. I am going to white emboss my sentiment on the inside of the card. I thought there was enough on the outside of the card that I didn’t want to make it look too busy. Here’s what the entire card looks like. The foil looks best from an angle. When you look at it head on, it can appear to be black. As promised, here’s the video of me making the card I shared with you yesterday!